In 2013, we have seen women on the streets and represented in the media in protest against a wide range of social, political and economic issues such as austerity economics, water flouridation, sexual assault case judgement, compensation for Magdalene survivors, abortion rights and more. 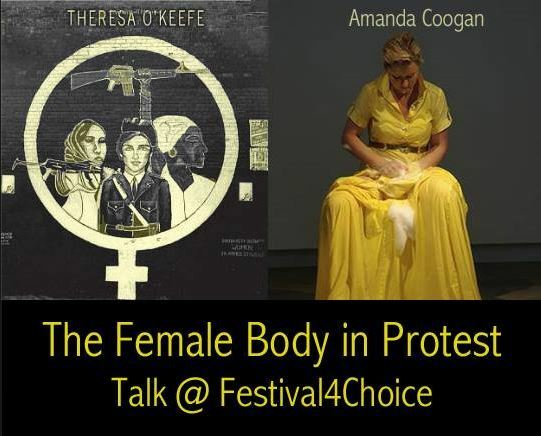 ‘The Female Body in Protest‘ presents insights from published scholar and activist Theresa O’Keefe and performance artist Amanda Coogan on methods of protest, challenge, representation and reflection. Drawing from feminist practices and engaged research, the concerns of both practitioners intersect the fields of arts, academia and action/performance exploring themes related to gender, representation, power and social issues. Following presentations by the speakers, attendees – which will include activists across campaigns, are invited to reflect on the female body as a contested site and explore feminist gestures of challenge, resistance and dissent that may inform the practice of protest in Ireland. Facilitated by artist Siobhán Clancy, an activist member of Abortion Rights Campaign. Theresa O’Keefe’s research concerns gender and social movements, feminist protest, gender, conflict and state violence, and feminist praxis. She holds a PhD in Political Studies from Queen’s University and currently lecturers in the Department of Sociology, NUIM where she co-founded the MA in Community Education, Equality and Social Activism. Prior to joining Maynooth she was a lecturer at the Equality Studies Centre, UCD. Her book ‘Feminist Identity Development and Activism in Revolutionary Movements’ was published in 2013.